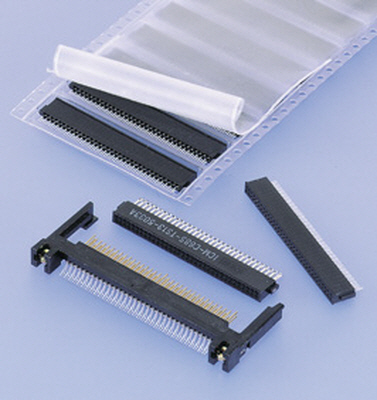 Socket and header which have 68 double-row circuits, conforming to PCMCIA (USA) and JEIDA Ver.4.1 (Japan). Header pins are designed to be protected against static electricity. The SMT type header is 0.635mm(.025")pitch, with single row solder tails positioned so that inspection and touch-up after reflow soldering is easy. Two mounting methods, dual row straddle type and in line SMT type with variation of PC board offset distance. Newly lined up springy grounding pin type socket provides easy but stable grounding circuit connection between PC board to metal section of card frame by springy No.1 and No.35 grounding pins. 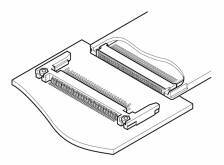 Headers for type III cards have a groove to be applicable to the low-voltage (3.3V) cards.